The Honeymooners is an American sitcom, based on a recurring 1951–55 sketch of the same name. It originally aired on the DuMont network’s Cavalcade of Stars, Jackie Gleason’s variety show and subsequently on the CBS network’s The Jackie Gleason Show, which was filmed in front of a live audience. It debuted as a half-hour series on October 1, 1955. Although initially a ratings success—becoming the #2 show in the United States during its first season—it faced stiff competition from The Perry Como Show, and eventually dropped to #19, ending its production after only 39 episodes (now referred to as the “Classic 39”). The final episode of The Honeymooners aired on September 22, 1956. 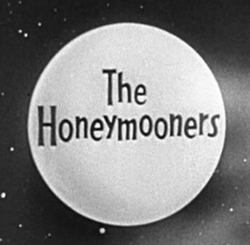 Creator/producer Jackie Gleason revived the series sporadically until 1978.The Honeymooners was one of the first U.S. television shows to portray working-class married couples in a gritty, non-idyllic manner (the show is set mostly in the Kramdens’ kitchen, in a neglected Brooklyn apartment building). The program is also popular internationally, particularly in Canada, Poland and Scandinavian countries Norway and Sweden.